Sun Aqua Farms was established in 1995 by family members to grow vegetables hydroponically for the commercial market in northeastern Pennsylvania. This endeavor grew out of a passion for hydroponics and a joy in watching plants grow, which continues to this day. We've expanded our reach somewhat, but we have not changed the solid principles on which we were founded: great food, great customer service. Our farm remains, as it has always been, family owned and operated. Starting with one greenhouse in 1995, we have now grown to 28 greenhouses where we now mainly grow basil which is picked to order and delivered 7 days a week, all year round, using sustainable agricultural methods. The basil is harvested by skilled workers and placed in fully recyclable printed plastic sleeves with its roots kept intact. A small amount of water is added to the package to keep the plant living and at its peak freshness. We are positive that you will find our live basil plants of superior aroma and taste to any other basil that you will find on the market. We believe that the quality of our product is what sets us apart. We only harvest the best plants of the proper size, and would rather lose a crop than send out any plant that does not meet our standards. Our farm is GFSI level certified, which means we adhere to strict food safety procedures and are inspected at least annually to ensure that we are following those policies and procedures. Sun Aqua Farms is also a member of PA Preferred™, a Pennsylvania program designed to promote local products of the highest quality from Pennsylvania producers. Greenhouse hydroponic farming can be much more environmentally friendly and sustainable than traditional agriculture. If fact, hydroponic farming can use up to 90% less water than conventional field-grown crops and can produce much more food per acre. The plants are grown with the roots exposed to a very weak, computer controlled nutrient solution, and with water and all the necessary minerals readily available, the plants grow rapidly to uniform size. They smell and taste as wonderful as they look, too! While Sun Aqua Farms' basil is not certified as organic, we do use alternative pest control methods, such as introducing beneficial predator insects. Due to the nature of greenhouse hydroponic agriculture, there are far fewer pests than field-grown crops to begin with, so pest control is only done on an "as-needed" basis. 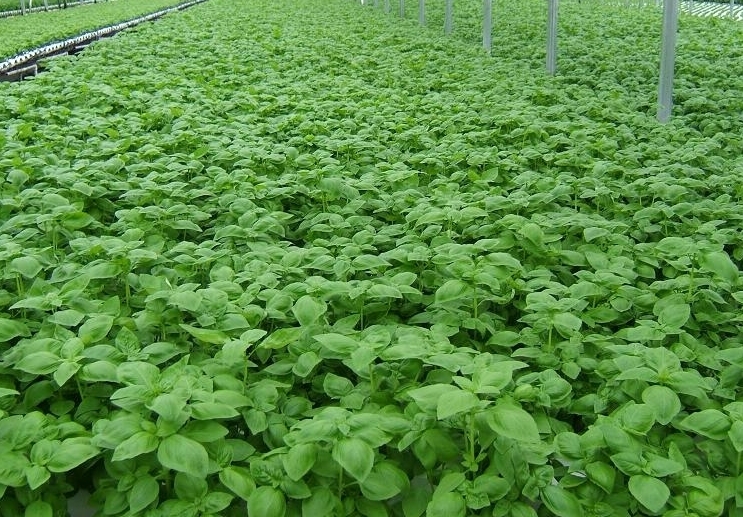 Our basil is on our farm from seed to harvest and is planted, grown, and packed on our farm with the greatest care and dedication, so you know when you buy Sun Aqua Farms' basil, you are buying from people you can trust to deliver the highest quality, freshest basil you can find.